I recently bought a Macbook Pro (13” Retina). A lot of thanks to my dad for helping me make this possible. I should have done this years ago, but I was stubborn about Apple. Better late than never. A few years ago, instead of buying a Macbook, I had built myself a PC desktop instead. Sure it was big and fast, but of all the things that I wanted the PC to do, it could only do entertainment right. Basically, the biggest powertool became the ultimate distraction. After getting the Macbook, I decided that I’d fix my PC up and give it to my little brother, who was still using this extremely tiny ultrabook with the smallest screen I have ever seen. There is no way that was good for his eyes. I was a hesitant at first in giving over the PC because I wanted to keep the monitor in order to do dual screen development with my Macbook, but I eventually decided that I wanted detachment from my PC more than I want to keep the monitor. The transfer went smoothly and now I have a new workspace that is much more comfortable. 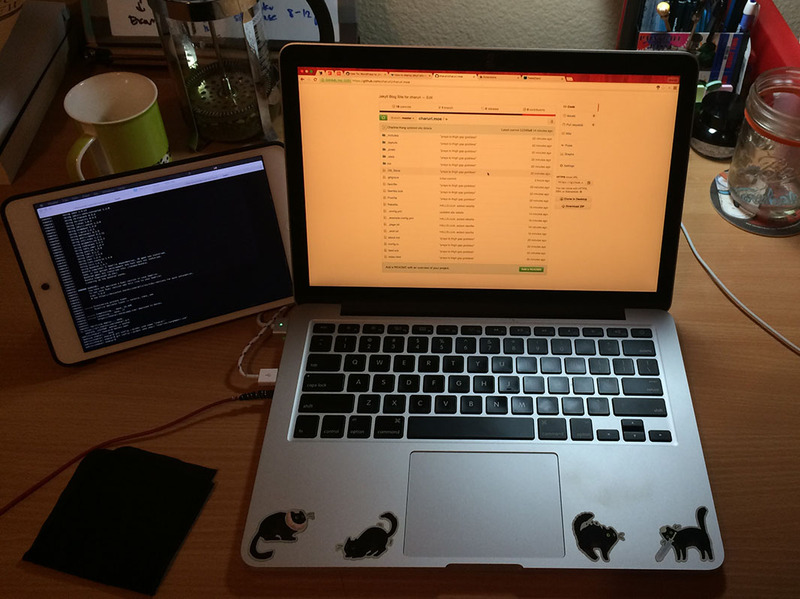 After getting used to working on the Macbook for a bit, swiping between workspaces got a bit repetitive and I often had to do it multiple times in one checking. I needed another screen. I did what I did best. I identified the problem and then checked to see if I could provide a possible solution with my available resources. I had an iPad Mini that I mainly used for reading e-books. I remembered seeing a product that allowed the user to use their iPad as an additional monitor a few months back on Product Hunt. At that time I was mainly developing in a Ubuntu Gnome setting which was incompatible with the app. I thought it might come in handy in the future so I saved it in my Product Hunt collection and now it is coming back to me! This product is Duet. Duet is the first app that allows you to use your iDevice as an extra display for your Mac using the Lightning or 30-pin cable. It is compatible for both Mac and PC, so no need to be salty here. Set up is extremely simple. You’ll need to download and install the app on both your computer and your iDevice. Download locations for the computer version are on the top bar of the site and the one for the iDevice is in the App Store. You’ll need to pay about $15.99 for the app, but that is easily more affordable than a monitor. This may be the first time that you may have to buy something that cost more than $3 in the App Store, but think about it. After you have the app installed on both machines, just launch them both. They’ll automatically detect each other and connect. That’s it. If you’re not familiar with using additional monitors, you’ll want to immediately edit the display settings and tweak it to your desired preference. Portable: You can dual screen anywhere! Don’t forget your cable! It’s the same as your charging cable so it’s not something you should forget. Always keep multiple charging cables, at least one in each bag. Multi-functional: Let’s say that you have a portable monitor. You wouldn’t be able to pull it out of your bag and start reading an e-book off of it. An iPad, would be able to do so much more. Cost: Cheaper than any monitor. Ease: Set up is extremely simple. Speed: Fast, almost no lag. As natural as an actual monitor. Service: From what I’ve seen, you can just tweet and they’ll help you. Compatibility: Only works for Mac and Windows. Wouldn’t work for let’s say, a game system, or a raspberry pi. Cost: What do you mean it’s not free?! Flux: The extra screen does not support flux, yet, so it may destroy your eyes when night comes. Size: The tinier your device, the tinier the screen! A blow for people who like huge screens. Duet has been a great alternative to a monitor so far. I am planning to stick with this configuration for at least another half a year because I am planning to move next summer. I don’t know what my new workspace would support or what I want for it, besides it being a standing desk. I also want to slowly take the time to look at monitors and decide which one best suits me. If my work requires me to be away from my workspace a lot, then Duet would be the way to go. I would like to say that I am a very happy customer! 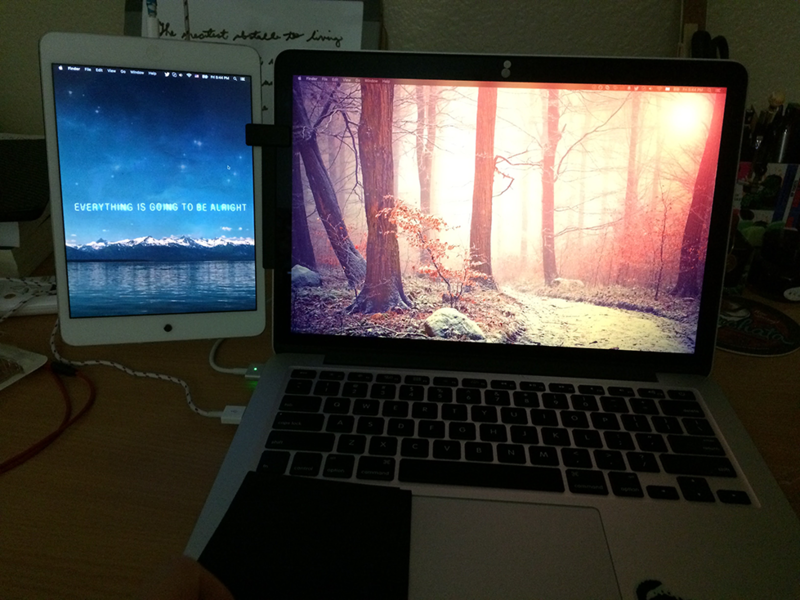 Thank you, @duetdisplay! Edit: I just saw a tweet that mounted the iPad onto the side of the monitor with a clip. It looks more comfortable. I will try it out and keep this post up to date. A few months later and Dual is still serving me well. One issue has appeared. Whenever Dual is running on the iPad, it would never turn off the device monitor, even in the case that it is no longer connected to a computer. For example, I turned off my computer and assumed my iPad would do the same with its screen and that I could just go on with the day, but it always kept it at a low power state. Even when I manually turned off the screen, a simple notification could turn it back on and it would resume back in that “low power state” without turning off the screen. It was the first time that my iPad managed to drain all of its battery within a day. Lesson learned. Exit the Dual app whenever you are done with it.